(02-11-2019, 02:54 PM)Stanglover Wrote: Looking pretty nice there. One word of caution, do not paint the flex blades. If you did then wipe them off. Better yet toss that fan and put a clutch fan or solid blade fan on. I used to work where they were made and I've seen the damage they can do WHEN they blow up. By now, there could possibly be stress cracks in the blades that you will not see with the naked eye. Those things are just plain dangerous! Just my thought on that, but do as you wish. Not too much more progress. But did get some more parts cleaned and painted. Installed the new duraspark dizzy and coil. My slop gray is a little light, may try to find something else a touch darker. 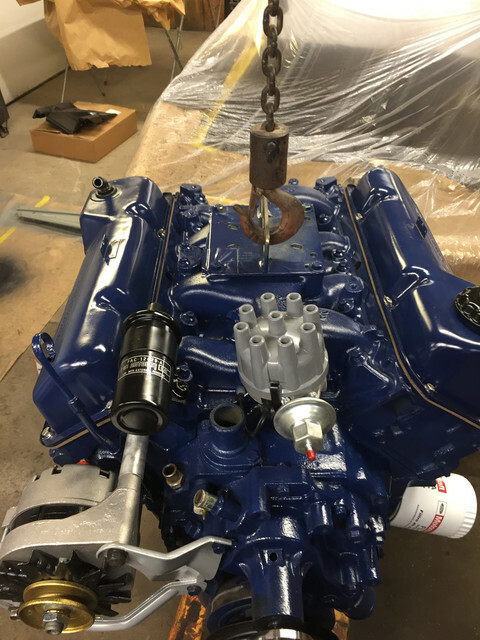 Hopefully start on the battery apron in the next couple days and get the engine bay prepped and painted. Also I am ordering a ring gear for the flywheel and see how that goes. Cant be that hard to replace and its a hell of a lot cheaper than a new flywheel. I see you powder coated in your oven (350-400F range I guess). What kind of powder did you use for this? Lots of new finishes are avail these days like the ones bellow, but I have no idea about what makes a good powder from another one. 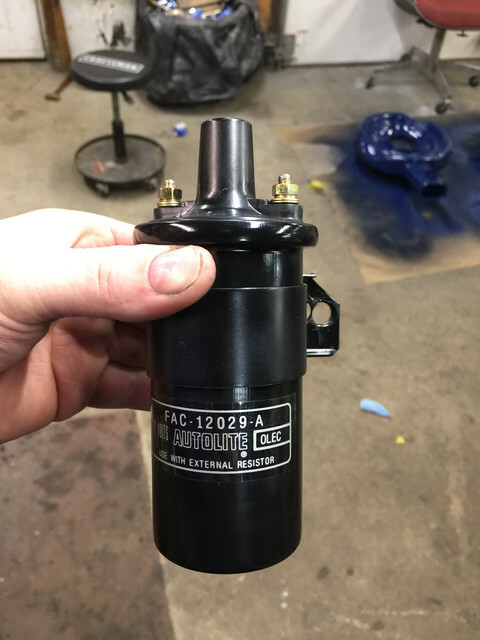 Kevin, one very minor 'detail' is to paint the vacuum motor on the air cleaner snorkel 'Cadmium' Ford used a silvery cadmium at that time. I worked were they were made by the million. Chrysler were all dichromate. I made hundreds of prototype vacuum motors over the years and now wish I'd scooped a box or two of parts!! It's ridiculous what vendors are asking for them now and I don't believe you'll find the cadmium, only dichromate. The car is going to look awesome when done. Your customer will be very happy for sure and appreciate the work you have done. It works very well for the price!! And it comes with some colors to get you started and supplies. The main thing is that the metal has to be CLEAN!!!! Spotless bare metal. I have access to an industrial glass bead blaster at work and it does the job GREAT! After it comes out of the blaster I spray it off with brakeclean, then before I shoot it I wipe it down again with wax and grease remover and handle the parts wearing latex gloves. I preheat the oven to 450. Hang all my parts on the rack and make sure they fit in oven before I shoot them. Also I preheat the parts in the oven for 10-15 min before shooting. Once they are preheated, I shoot a nice thick coat of powder on them. The gun has a separate button you hold while you spray the powder that puts an electrical charge throughout the parts. You cant put too much on, you want to completely coat them. I usually make a box lined with aluminum foil to catch the excess powder to reuse. Put the coated parts in the oven at 450 for a few minutes till you see the powder start to flow, then you turn oven down to 400 and bake for 20-30 min. You can stop at that point but, I like to put 2 coats on. So while it is still hot I pull the parts out and recoat them a 2nd time. Put in the oven again and repeat times and temps. This usually makes sure you get all the nooks and crannies of the parts. I usually buy my powder off of eastwood, but their shipping times have been horrible!!! I started buying some powder off ebay, it was Sherwin Williams brand and it flows out REALLY NICE!!! Its a little more expensive but really nice. This kit is nice if you have a spare oven in your garage. I got mine given to me free so it works great. DO NOT use the wife's oven!!! This puts off some fumes and you don't want to eat anything out of that oven afterwards. 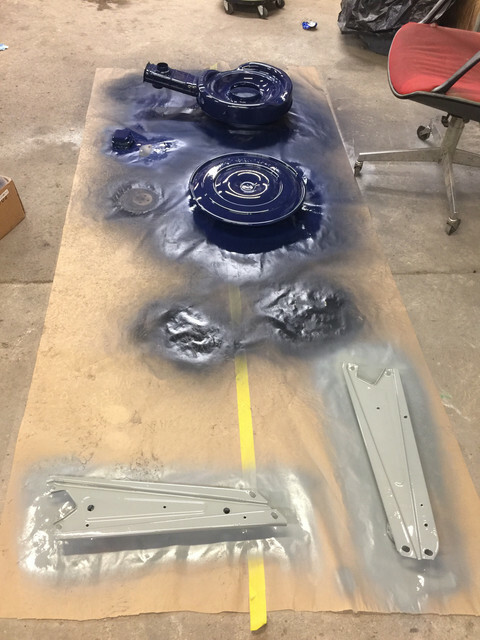 Takes a little longer than your standard spray painting, but the pieces are much more chip resistant, chemical resistant, and rust resistant!! I can only do pieces that can fit in a standard house oven, but it works for me. I even clearcoated my intake on my care with satin clear, and it looks great still. Doesn't yellow like spray clear can when exposed to gas and other chemicals. Let me know if you have any other questions! I have been doing it a couple years. I'm sure there are things others do different but this works for me! thx for the details Kevin. I got enough "mess" in my garage atm (busy with electroplating), but I'd love to try this at some point. For not too big steering/suspension/brakes components, powder coating is very attractive. You ment too much powder or current? I guess powder. What would then happen, if you did? Once you have sprayed, how's the powder holding? I mean a little shock, wind and it all falls down or its fairly "sticking" to the surface? You say you can apply multiple times, how does the new layers stick? Is the powder conductive? As if not, how does the circuit works if the coating builds up and isolate the part? Or is it that you apply the new coats while it's still bits hot and its sticky? (02-13-2019, 12:22 PM)Fabrice Wrote: thx for the details Kevin. You ment too much powder or current? I guess powder. What would then happen, if you did? The current is not adjustable on this gun, just push button and pull trigger. You CAN'T put too much powder on. The metal will only take as much as it can hold. The excess fall into the tin foil lined box under the parts, to be reused later. Once you have sprayed, how's the powder holding? I mean a little shock, wind and it all falls down or its fairly "sticking" to the surface? The powder is held on initially by the charge from the gun. You have to be very careful when loading the parts into the oven. Even a small bump and some powder can come off. But its on there pretty good if you preheated your parts. I always do a dry run with the parts hanging on the rack and plan my route to the oven, in the oven, and back to my box BEFORE I ever shoot any powder. Its better to find out then if your going to have clearance issues in the oven or with something in your way. You say you can apply multiple times, how does the new layers stick? Is the powder conductive? As if not, how does the circuit works if the coating builds up and isolate the part? I hang my parts from stainless steel wire on my oven rack that is also metal. I clip the guns ground wire to the oven rack and it conducts the charge through all the parts hanging on the rack. I clean off my rack every once in a while with a flapper disc to make sure all the parts are making good contact. Or is it that you apply the new coats while it's still bits hot and its sticky? I apply the second coat as soon as they come out of the oven after the first coat. Be careful they will be HOT, 400*. 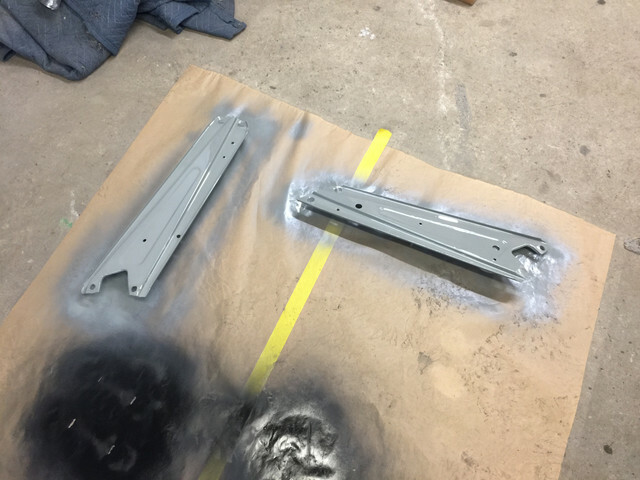 I set the rack back on my box, clip the ground wire to the rack, and proceed to shoot the second coat. Even if the conductivity isn't as good, the overall heat of the part helps the new powder stick very well. 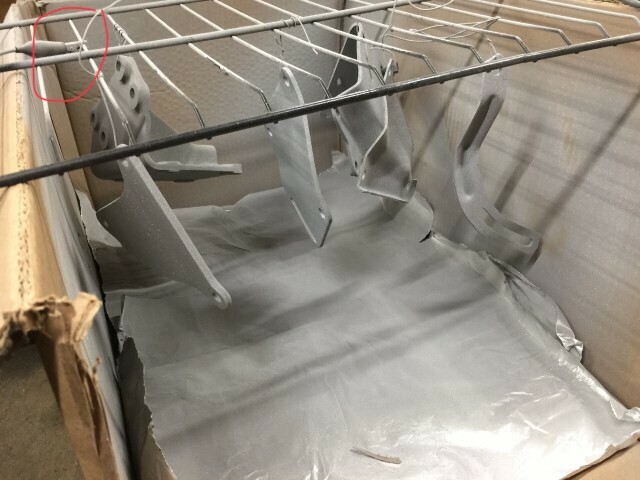 And when the parts come out of the oven after first coat, they are not sticky at all. they are fully cured and ready for use once they cool down. As you spray the second coat on you can almost watch it start to flow out over the part. its pretty cool to see. 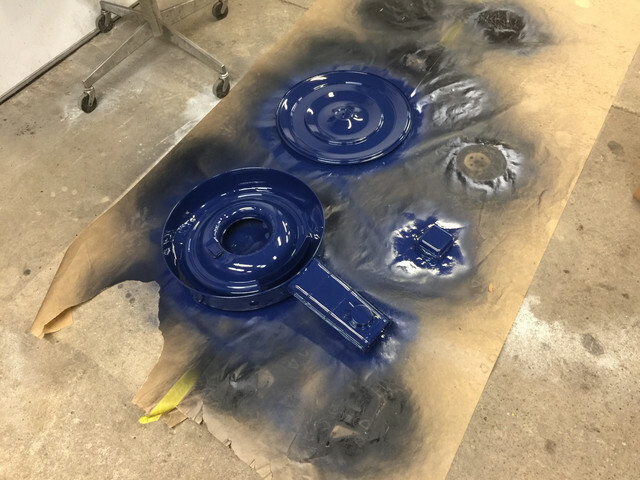 Once they come out of the oven after 2nd coat and they cool, you can put them right into service! See pic below for ground wire on rack.